I can't believe I'm listing another Colorado tradition that I have never actually experienced! It's a little depressing. 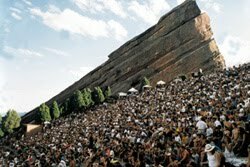 I know many, many people who have attending the Easter Service at Red Rocks and all of them have been thrilled with the experience. You will find all of the details at their website. Get there early and remember to dress warmly are the keys to a pleasant experience. It is a sunrise service, so prepare to be in awe of God and nature!